Vigdís Finnbogadóttir (Icelandic: [ˈvɪɣtis ˈfɪn.pɔɣaˌtoʊhtɪr] ( listen); born 15 April 1930) served as the fourth President of Iceland from 1 August 1980 to 1 August 1996. She was the world's first democratically directly elected female president. With a presidency of exactly sixteen years, she also remains the longest-serving elected female head of state of any country to date. Currently, she is a UNESCO Goodwill Ambassador, and a Member of the Club of Madrid. She is also to-date Iceland's only female president. Vigdís Finnbogadóttir was born in Reykjavík on 15 April 1930. Her father, Finnbogi Rútur Þorvaldsson, was a civil engineer, as well as a professor at the University of Iceland. Her mother, Sigríður Eiríksdóttir, was a nurse and the chairperson of the Icelandic Nurses Association. They had two children: Vigdís and then a son, Þorvaldur, a year later. After passing her matriculation exam in 1949, Vigdís studied French and French literature at the University of Grenoble and the Sorbonne in Paris from 1949 to 1953, then studied the history of theater at the University of Copenhagen. She then acquired a BA in French and English, as well as a Professional Graduate Certificate in Education, at the University of Iceland. She married a physician in 1954, but divorced in 1963, and at the age of 41 she adopted a daughter, being the first single woman who was allowed to adopt a child. After graduation, Vigdís taught French and French drama at the University and worked with experimental theatre. She worked with the Reykjavík Theatre Company from 1954 to 1957 and again from 1961 to 1964. During the summers, she also worked as a tour guide. Vigdís taught French at Menntaskólinn í Reykjavík 1962–67 and at Menntaskólinn við Hamrahlíð from 1967 to 1972. She also taught for a while at University of Iceland, as well as holding French courses on RÚV, the Icelandic state television. Although the Icelandic presidency is largely a ceremonial position, Vigdís took an active role as environmental activist and fought for Icelandic language and culture, acting as a cultural ambassador in promoting the country. She emphasized the role of smaller states and hosted a crucial summit between U.S. President Ronald Reagan and Soviet leader Mikhail Gorbachev in 1986. She had as her motto: 'Never let the women down' and worked specifically to promote girls' education. She was also aware of her role as a model for young women. In 1993, the work Mitt Folk, commissioned by the British government, by the composer Oliver Kentish was dedicated to her as a gift from the United Kingdom to Iceland celebrating the 50th anniversary of the republic. She is also a member of the Fondation Chirac's honour committee, ever since the foundation was launched in 2008 by former French president Jacques Chirac in order to promote world peace. Vigdís is a member of the Club of Madrid, an independent non-profit organization composed of 81 democratic former Presidents and Prime Ministers from 57 different countries. ^ "Club of Madrid: Vigdís Finnbogadóttir". Club of Madrid. 2003. Archived from the original on 12 August 2017. Retrieved 19 July 2010. ^ "Club of Madrid: Full Members". Club of Madrid. 2003. Archived from the original on 10 October 2007. Retrieved 30 March 2008. ^ "Finnbogi Rútur Þorvaldsson". geni_family_tree. Retrieved 9 May 2018. 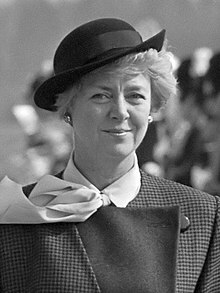 ^ a b c "First female head of state, Vigdís Finnbogadóttir, elected 35 years ago today". Iceland Magazine. 29 June 2015. Retrieved 26 June 2016. ^ "Cadenza Musicians Directory". Retrieved 2 December 2008. ^ "Honor Committee". Retrieved 22 May 2018. ^ "Queen Iceland". Retrieved 22 May 2018. ^ "President Vigdis blir æresdoktor ved UNIT". Aftenposten. 1993. Retrieved 2 August 2010. ^ The Club of Madrid is an independent non-profit organization composed of 81 democratic former Presidents and Prime Ministers from 57 different countries. It constitutes the world's largest forum of former Heads of State and Government, who have come together to respond to a growing demand for support among leaders in democratic leadership, governance, crisis and post-crisis situations. All lines of work share the common goal of building functional and inclusive societies, in which the leadership experience of the members is most valuable. This page is based on the Wikipedia article Vigdís Finnbogadóttir; it is used under the Creative Commons Attribution-ShareAlike 3.0 Unported License (CC-BY-SA). You may redistribute it, verbatim or modified, providing that you comply with the terms of the CC-BY-SA.